Getting rid of mold can be quite a tricky ‘business,’ especially if you are into all-natural cleaning. Conventional mold removers are packed with strong chemicals and toxins. Bleach and borax do miracles, but they also release health-harming vapors. You definitely do not want these near you and your family. Mold is unhealthy as well, and there has to be something you can do. We give you some handy natural alternatives that do not harm environment, nor release dangerous chemicals. 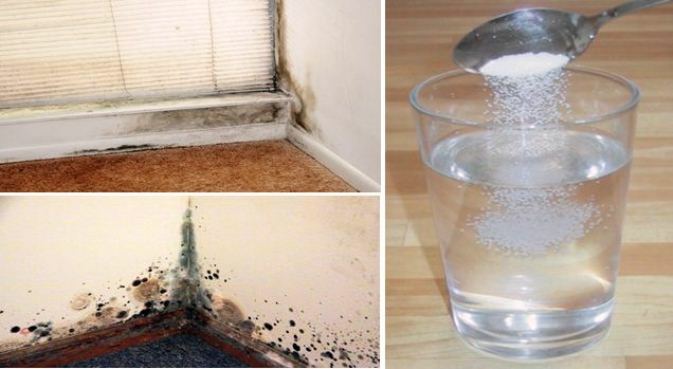 Always opt for natural solutions to get rid of mold and protect your health. Natural alternatives shall eliminate the last bit of this pesky invader. Mold is dangerous if you are allergic to it, but it is harmful to healthy individuals as well. It can cause fatigue, depression, sinusitis, skin irritation and other ailments. Check the most efficient natural solutions for your mold, and you will never ever have to fear of taking a deep breathe. It is a nice solution to the mold issue, plus it is easily available and inexpensive. All you need is 3% hydrogen peroxide and a spray bottle. Spray it on any affected area, and let it act for 10-15 minutes. Scrub well and wipe clean using a cloth. This will remove any remaining spores. Combine hydrogen peroxide, vinegar and baking soda into the mightiest solution ever. Keep in mind that hydrogen peroxide should be kept in dark glass bottles, otherwise it will lose its properties. It also works great on moldy surfaces. Spray it on your walls, and let it act for several hours. Scrub well using a brush. If you cannot stand its smell, make a solution, but keep in mind that it will not give you the same effect as pure vinegar. You can always add a tiny bit of any essential oil to enhance its scent. Studies have shown that vinegar destroys 82% of the mold spores, and it also kills off bacteria and viruses. It makes for an excellent prevention measure. Just spray it on your walls and let it dry completely. It may cost a bit, but 2 teaspoons will sure come handy for a longer period. Stir 2 teaspoons of tea tree oil into 2 cups of water, and transfer the solution into a spray bottle. Spray your moldy walls, and let it do its job. Do not bother washing it off the walls, because its scent will fade away. The best thing about this solution is that is has no odor. These extracts are odorless, which is great for those with sensitive noses. Add 20 drops of the extract to 2 cups of water, and keep the solution in a spray bottle. You should not rinse this one as well. It is super cheap, yet effective solution. Dilute it in some water, and spray your walls. Let it act for a while, scrub well and wipe clean using a damp cloth to remove the spores. Baking soda does not leave unpleasant smell behind, which makes it an absolute favorite. It does not necessarily mean that only moldy areas should be treated. You can always prevent the occurrence of mold by wiping damp areas, and spraying vinegar or any other efficient solution. Get a cool mist humidifier, and put your home in order.